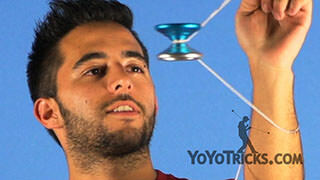 Learn Paul Kerbel’s yoyo trick, the Pandora. 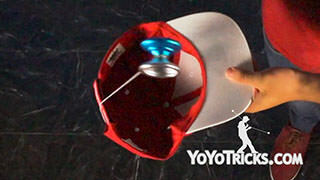 Pandora Yoyo TrickIn this video I am going to teach you how to do the Pandora. Okay so to start we need to do a hook that goes over both hands and in order to do that we need both hands to be close like this. 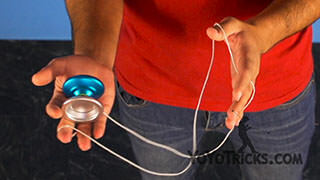 So all this mount is just a hook with both hands in the way of the hook so if you are having trouble hitting it you can just do a normal hook like this and put your finger in-between these two strings like this and of course the trick will look better if you hit it the right way. 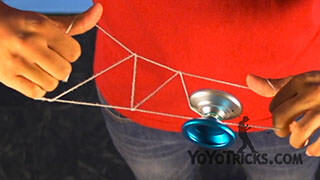 Once we are in the mount what we need to do is a trapeze motion into the non yoyo hand and land on the front string. 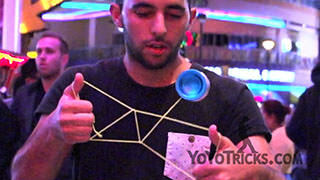 Do not forget you need the back string around your hand and not just your finger like this. 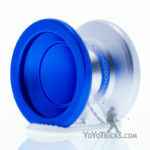 So now we are going to put our non yoyo thumb into the middle string like so and swing it into a brother, trapeze and brother mount. 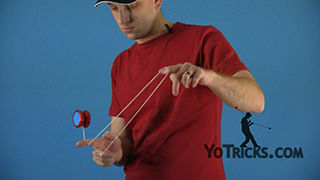 From here we will want to pinch the string with the middle finger and index finger of your opposite hand and flick the string off your thumb of your opposite hand like so in order to get into a trapeze and brother kind of mount with this slack going off of the yoyo finger. 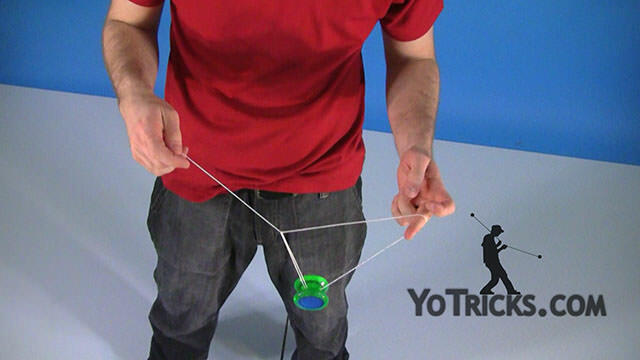 From here we are going to move the slack coming from our opposite hand in front of the yoyo and into the gap, like this, and we will fit this index finger into this loop and finally we will swing this extra slack into your opposite thumb. 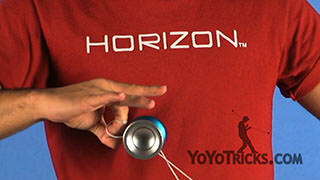 The next thing we need to do is, from here move the yoyo around your yoyo hand like this and back. Then we are going to drop the string off the opposite thumb and with the help of the yoyo finger we will move around this slack in front of the yoyo and into the gap and then we just pull it tight with the opposite hand and make sure you keep the motion going so the trick looks good, the next thing we need to do is put the opposite thumb inside the loop under the top string like this and we are going to go around the yoyo taking a string out of the gap of the yoyo. 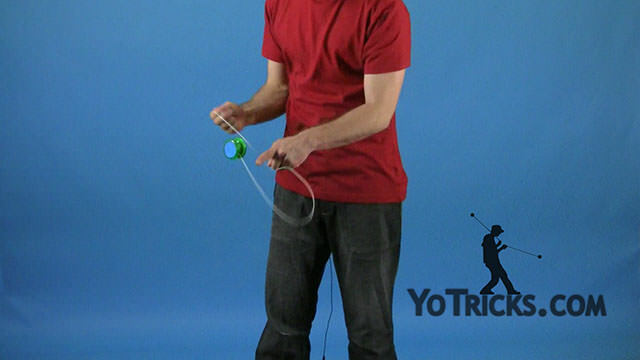 Then we are going to pinch with our opposite thumb and opposite index and we are going to drop the only string that is in our yoyo hand at the same moment we do a trapeze motion like so. From here we are going to move the string that is hanging from our opposite hand to the back of the back of the yoyo and into the inside of the yoyo then we will pop the yoyo towards our yoyo hand like so to end up in an inverted GT(green triangle) then we want to drop this whole GT and catch it under our yoyo hand and to get out of this we will move our yoyo arm in front of the yoyo and then pop the yoyo to the front and then we will perform a sky bind. This is the trick Pandora.